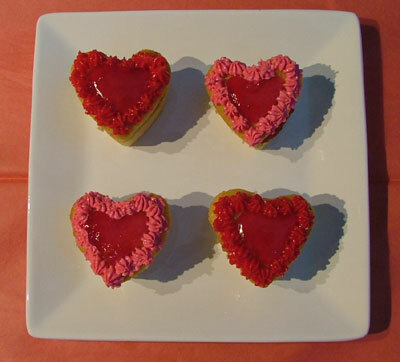 These heart cupcakes could have fresh raspberries and slices of fresh strawberry on the top and then have the red glaze. I think they are very attractive to look at. They could also have fresh fruit inside and fresh cream in all types of combinations. Raspberry jam or cherry jam would also be a good alternative. I have also seen lots of pomegranates in the shops so perhaps they could also be used as an attractive fruit for valentines cupcakes.